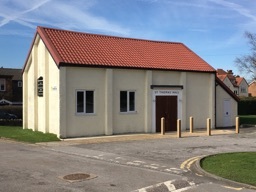 St Thomas’ Hall was created in 2016 from a semi-derelict building which has served various functions such as a school dining hall and a squash court. 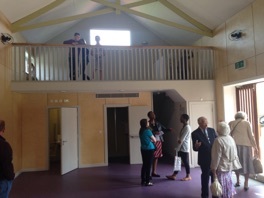 It is now an attractive modern space which is particularly suitable for children’s activities and smaller gatherings which do not require sophisticated catering. The name is in memory of the church of St Thomas of Canterbury at Whyteleafe which was closed in 2012 and, having become unsafe, has since been demolished. It, and our hall, acknowledge that the Pilgrims’ Way passes through our parish. It has a small galley kitchen with kettle, fridge, mugs and cutlery. There is a disabled loo, but access for the disabled is not easy; in theory one can gain wheelchair access through the further door, though there is a tight turn. The main doors have a step down inside.